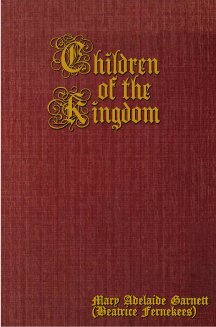 Children of the Kingdom is a wonderful book to read to children. You will love this book! Build your favorite memories reading these short stories about saints to your children and grandchildren! By Mary Adelaide Garnett (Beatrice Fernekees), 1915. Downloadable Catholic ebook: A true Alphabet of Roman Catholic saints who were children, a very sweet children's book. There are two saints for each letter, one boy one girl, except o, p, q, u, x, y, and z. The beautiful pictures alone are worth the price! Some are old photos of such as the Roman Coliseum. You can see a sample chapter and sample pictures at the links. Our children love Children Of The Kingdom, by Mary Adelaide Garnett (Fernekees) 1915. It is a true alphabet of saints who were children! 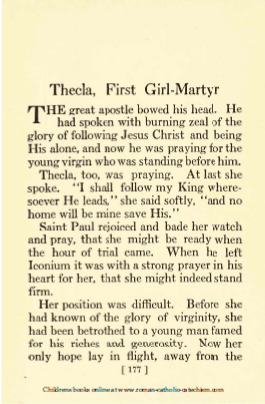 After stories about Mary, Queen of all Saints and St. Joseph; the book covers boy saints and girl saints for nearly each alphabetical letter, A-Z. All told, there are forty-eight Catholic saints stories. This endearing little book will charm children and adults and encourage practicing the virtues in all who read it or hear it read. "In these days of early First Communions, it is well to place before the child mental pictures of those whom the Church honors as childhood's saints." "As types of holiness, the little saints are not at all beyond the imitation of the average child of to-day." "...to be victors in the conflict, the child soldier of Christ to-day needs the high courage and stainless nobility of God's martyrs." "They learn to scorn what is low and base, sincerity reigns in their hearts, and they in turn, in another age, and in another way, become 'Children Of The Kingdom'". I have read this dear book to my children and hope that you can enjoy the same. Our children really enjoyed the stories of other children who were good in a heroic manner. The stories are short for reading to tiny children. Simply bring it up on your eReader and snuggle in for a cozy moment in time. Little ones who are just beginning to read "chapter books" love it too. They are delighted when they "get to" use an eReader, too. We loved snuggling on the couch reading about these sweet saints. The stories are very short, only about 2 or 3 pages; so we could simply read one, or gobble up several stories. Children Of The Kingdom is a great patron saint list including both male and female saints who were children. Treasure the Baptismal and Catholic Confirmation names you can get from this book and, later, watch your child's joy at being named for these patron saints! Roman Catholic Baptism requires a Christian name; choose from these jewels! Our presentation of this book is on PDF format for downloadable books like e-reader books. E-readers offer an awesome opportunity to collect a whole library of books that you can always have at hand! A true pocket library! 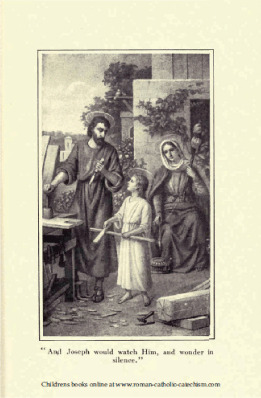 St. Anne's Helper provides this book in PDF downloadable format so that you can also print the book and have it spiral bound or put it in a binder. 'Just add paper! There are many elderly who read Children of the Kingdom as children. If they have an ereader, they can keep this in their "library" for whenever the grandchildren visit. Grandparents can read this sweet book to a child at any time. Do the grandchildren come often? Do you have time spent waiting in line? Consider eReaders as gifts for the elderly when you are choosing a Mother's Day gift, Father's Day gift, birthday gift or Christmas gift! Many elderly would treasure The Children Of The Kingdom since so many had read it as a child. Remember to download to a desktop before trying to add it to an Ipad.